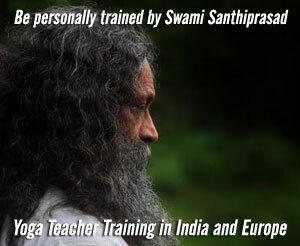 Yoga Teacher Training Europe October 2015 | School of Santhi Yoga Teacher Training Europe. RYS 200 by Yoga Alliance. IRYS 200 by International Yoga Federation. International Yoga Teacher Certificate. 200 hours Yoga TTC 200 October 2015. CERTIFICATION - TTC 200. 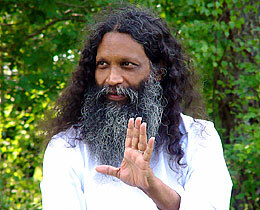 BE TRAINED BY SWAMI SANTHIPRASAD WORLD RENOWNED INDIAN SPIRITUAL YOGA MASTER AND YOGA GURU. RECOGNIZED BY YOGA ALLIANCE RYS 200, RYS 500. RECOGNIZED BY INTERNATIONAL YOGA FEDERATION IRYS 200, IRYS 500. If you have a serious interest in learning traditional Yoga directly from a Spiritual Yoga Master, if you accept to follow our student rules, if you accept to study hard to complete the course program - then you are most welcome to apply for this first level of our Yoga Teacher Training program. Students have to make their own arrangements to get to the TTC. Details of how to get there will be sent when your admission is confirmed. Please be in time. This is a 200 hours Yoga Teacher Training program to mend efficient Yoga Teachers and Yoga Instructors with in-depth knowledge in the Science of Yoga. 64 different Asanas from intermediate level to advanced level and Soorya Namaskar besides studies in Yoga teaching practice, philosophy of Yoga, kriyas, bandhas, pranayama, mantras, relaxation, human anatomy and physiology, physiology of Yoga Asana and pranayama, Yoga nutrition and food, meditation, sanskar re-engineering, different systems of Yoga and Yoga therapy. are affiliated to TNPESU, The Tamil Nadu Physical Education & Sports Uniersity, Government of Tamil Nadu, approved by University Grants Commission (UGC) and the only affiliated Yoga School in Kerala. TNPESU The Tamil Nadu Physical Education & Sports University, established by an Act of The Government of Tamil Nadu in 2004, is unique and the first of its kind in India as an affiliatory University exclusively for Physical Education & Sports. strictly follow the standards and guidelines for Yoga Teacher Training courses set by Yoga Alliance US and International Yoga Federation in all our Yoga Teacher Training programs. is designed by Swami Santhiprasad with a view to enable the participants who are successfully completing the program to become professional Yoga Teachers and Yoga Instructors within 2-3 years time. Yoga Alliance US and International Yoga Federation. in all the 8 steps of yoga. chakras will be studied in detail. Yoga teachers to spread the message of Yoga without losing its spirit. The intensive daily schedule includes Yoga Asana practices, Pranayama, Meditation sessions, Mantra Chanting, Yoga theory sessions and Yoga teaching practices. we reach 64 number of Asanas. Karma yoga is the practice of selfless service You will be asked to do various tasks during the last retreat including cooking, cleaning, office work and any other work necessary for the smooth running of the retreat. Considered as the sum and substance of all the spiritual teachings of India. Bhagavad Gita contains subtle and profound teachings. Our endeavour is to seriously guide the student on the spiritual path of Yoga, the science of body, mind and soul in the traditional Gurukula system prevalent in India long ago. The culmination, you will get to know the real you in you. our schools yoga lessons are perfectly suited to serious spiritual Yoga seekers, not for tourists looking for comfort, pleasure and entertainment. The experience provides immense joy. just as envisaged in the traditional Indian Gurukula System, personal attention is ensured to each student and to facilitate this our sessions are conducted in small Yoga groups. is open to all Yoga students, both Indian and international. Yoga students interested in learning classical yoga in the traditional way directly from the spiritual Yoga Master will definitely be benefited. In the present social and cultural backdrop, the traditional and eternal knowledge of spirituality is imparted in an inimitable and easily comprehensible method, designed and successfully experimented by the School of Santhi Yoga Teacher Training School in India and Europe through English. When Swami Santhiprasad guides you into Meditation or speaks about Siva RajaYoga, Karma Yoga, Jnana Yoga, Bhakti Yoga,Raja Yoga, Swara Yoga, Kundalini Yoga, Tantra Yoga, Prana or reveal the deeper and truer aspects of the Chakra natures, when he explains the Yoga Sutras of Patanjali or gives you practical guidance in proper breathing, Pranayama or Yoga Asanas, it is a spontaneous flow of love and devotion from a Spiritual Yoga Master. and is in every one of us"
Swami Santhiprasad addresses to the spirit of the heart, not only to the mind.